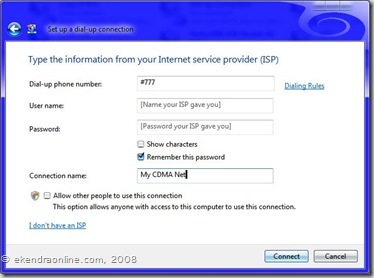 If you are a owner of Spice D88 or D88n or similar mobile sets, and want to internet connect in your Computer/Laptop via mobile phone but the driver installation for the mobile phone modem has hindered due to Vista’s 64 bit on your way. 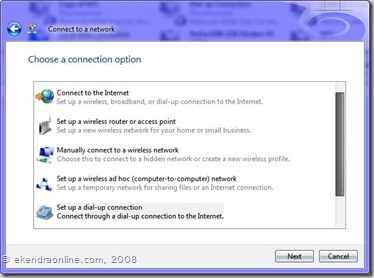 Here’s the complete visual guide on how to set up mobile sets as modem for connecting internet in laptop or desktop. Similar article for 32-bit (normal) Windows Vista is posted here. Screenshots are from Spice Mobiles D88 and Windows Vista 64x Home Premium. You also need the initial mobile driver/software installation disc handy. Initial steps: Insert the installation disc(CD or DVD) or in case you didn’t have one, there might be set up folder in the phone memory (card)—copy it to your hard disk. Time to connect your mobile phone to the USB port (or PCMCIA port, in rare cases). The best approach is to install (by autorun) the driver and necessary programs- for Spice D88 you can find one at their official website, spicemobiles.in. 1. Driver Software Installation: initial search for preconfigured driver folders (if might skip few steps more below) Click screenshots to see their full size. 2. The driver software for Mobile Phone USB Modem Driver has been successful. Port address COM9 may vary. (You might be asked for the installation disc or path, my suggestion run the driver setup file from the installation folder.) Remember the port address. 3. Driver has been installed. Now time to detect your mobile phone as a modem to connect internet. 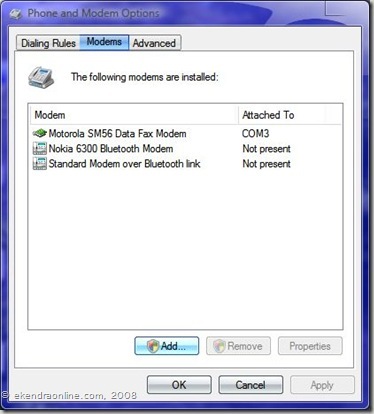 Phone and Modem options can be found at Control Panel. 4. Click Add to add new hardware ie your mobile phone. Add Hardware Wizard appears. 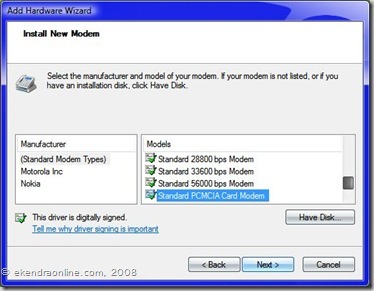 Select Standard Modem Types on Manufacturer (above already configured handhelds) and on the models side, go to the button to select Standard PCMCIA Card Modem. 6. 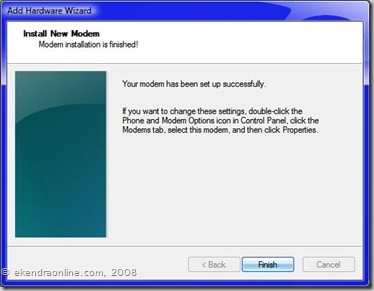 Your new modem has been set up successfully. So far so well. 7. 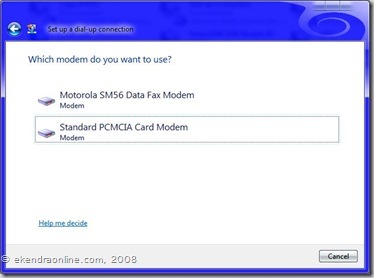 Now select the Standard PCMCIA Card Modem you just installed from Modem tab of Phone and Modem Options. Click Query Modem to verify if the command will respond Success. b. 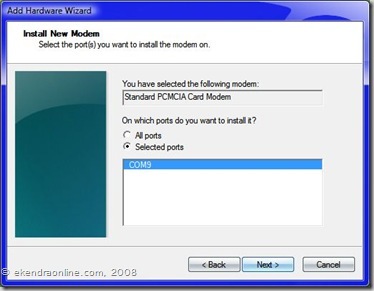 Select the modem you want to use to connect to the internet. 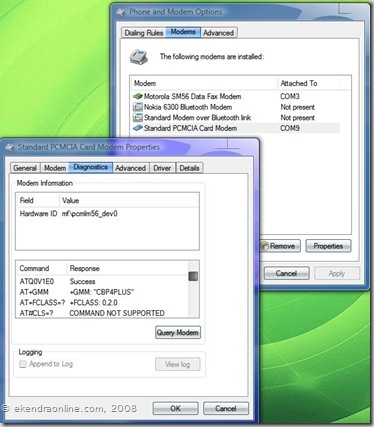 Select Standard PCMCIA Card Modem for Spice D88 or similar mobile. c. Enter the Necessary information provided by the ISP (Internet Service Provider) or your mobile phone company. Then connect to access to the internet. That’s it. 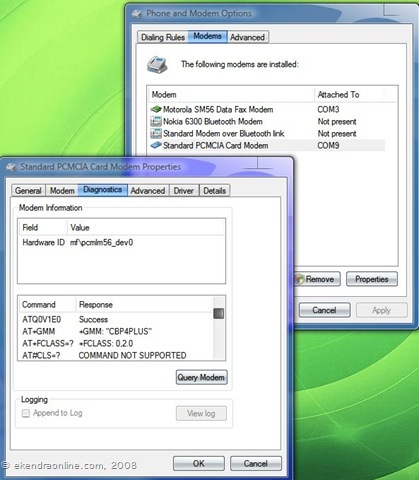 Windows Vista 64x troubleshooting for Mobile Phones as a modem. Comment if you have any confusions. Select similar links or most wanted topics if you like.